Our consultancy, solutions and services provide innovation, creativity and add value. Rigid printed circuit boards are used in all but the simplest electronic products. Deliveries range from 24 hours through to standard production circa 20 days. Flexible circuits (also variously referred to as flex circuits, FPC's and flexi-circuits) have been used for interconnecting electronic devices since the 1950s.It is now one of the most important interconnection technologies in use for the manufacture of many of today's most advanced electronic products. As digital applications have continued to gain in speed, some of the general-purpose PCB materials typically selected for fabricating those circuits, such as FR-4, fall short in performance for various reasons. The PCB parameters that can be used for guidelines when choosing circuit materials for high-speed digital applications include Dk, dissipation, loss, and even dielectric thickness. The dielectric constant, Dk, of a PCB material has long been a guiding parameter for both analog and digital circuits since it is so closely related to the impedance of the circuits that will be fabricated on that material. As consumer demands change, so must technology. 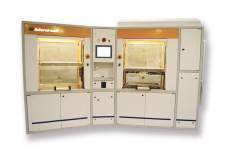 By using HDI technology, designers now have the ability to place more components on both sides of the PCB. New products and processes are constantly being developed for the ultra advanced technology requirements. Engineering and Technology driven we look to add value and reduce costs without compromise to quality or functionality, we have extensive knowledge and experience in all types of Printed Circuit Technology and also offer a “fast turn-around service” for proto-types and pre-production volumes. Stevenage Circuits: Established in 1971 are a World Class supplier of all types of Printed circuit technology. Our capability ranges from single and double sided PTH rigid PCB's through multilayer rigids up to 44 layers and onto flexi (FPC) and flexi-rigid using a variety of materials. We also specialise in manufacturing RF and High frequency (Microwave) PCB's of all designs and structures. 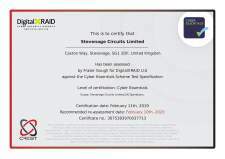 Stevenage Circuits Ltd are proud to announce that it has been assessed and certified against the Cyber Essentials scheme test specification. A primary objective of the UK Government's National Cyber Security Strategy is to make the UK a safer place to conduct business online and all suppliers must be compliant with the new Cyber Essentials controls if bidding for government contracts which involve handling of sensitive and personal information and provision of certain technical products and services. Stevenage Circuits have installed a hole (resin) filling system from ITC Intercircuit GmbH to meet the increasing demand for the filling of micro-vias, blind vias and small diameter or high aspect ratio through holes.